As most here have followed the climate issue for some time I'm sure we have each been faced with climate skeptics throwing out big numbers related to different aspects of climate science. There is the ever present "31,000 Scientists Who Challenge Global Warming," the infamous Oregon Petition. These folks have yet to meet…. The Denominator! 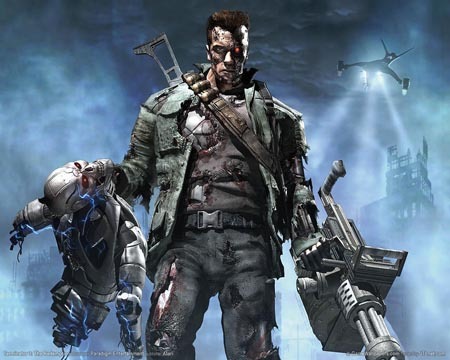 Fig 1 - Okay, this is really the Terminator but bear with me, the effect is about the same. In this exercise we are going to give both the Oregon Petition and PopTech's 850 papers the benefit of the doubt. We know there are many many reasons to challenge the assumptions of their claims but there is one thing they can not defend. They are only presenting one side of the equation. First, let's look at the Oregon Petition. They define "scientist" as anyone with a BS degree or better. They state, "This includes primarily those with BS, MS, or PhD degrees in science, engineering, or related disciplines." Thus, 31,000 is their numerator. According to the US Census for 2000, 28 million people had bachelors degrees and 16 million had graduate or professional degrees. We'll safely assume that half of the bachelor degrees are BA's and not BS degrees. In 2000 that represented about 10% of the population. If the proportions hold today it leaves us with a total of 31 million people of the current US population of 312 million (Note: the Oregon Petition is limited to the US). Numerator, meet The Denominator! 31,000 over 31,200,000 comes to 0.00099. Or roughly 0.1% of persons holding a BS or better have signed the petition challenging anthropogenic global warming, assuming that every single signature on the list is legitimate. This is what The Denominator does. He crushes big numbers into itty-bitty numbers. Here I just went to Google Scholar. I limited the search to the term "climate change" and only searched articles in the subject areas of 1) Biology, Life Science and Environmental Science, and 2) Physics, Astronomy and Planetary Science. That returned 954,000 articles. I did a pretty thorough perusal of 200 articles of the 100 pages of results and it looks like they are all actual papers and not just references to any blogs or websites. A number are listed as "[citation]" so we might pull out about 10% for good measure. But everything else looks to be published works in a very wide variety of scientific journals. I intentionally left out the 177,000 papers that result when I do the same search on "global warming" since I don't know how many of those will be duplicate hits. Update (Feb 18): In the comments Poptech has brought up several valid points about the search results I came up with. In an effort to better quantify the denominator I did some additional research. I did year by year searches going back 40 years on "climate change" and "global warming", excluded citations, and checked for various other erroneous results. The outcome was, without even addressing the accuracy of the numerator, that the percentage does not change dramatically. My first cursory search returned 0.1%. The more detailed work resulted in 0.45%. It's a big improvement for Poptech, by almost a factor of 5, but still the denominator is so large that it dwarfs the numerator. If a qualified outside group were to audit Poptech's list I believe the numerator would also shrink significantly. There is plenty of room for skepticism in all areas of science. Good science relies on healthy skepticism. One highly biased individual creating a subjective list does not rise to the level of good scientific skepticism. Kudos for the math. But the numbers are even more cruel to the climate deniers when you take into account that not everyone on the Oregon Petition is an actual scientist or even an actual person. The same goes for the PopTech list where not every paper is published in a peer reviewed journal. The all too familiar name "Energy & Environment" pops up quite often on that list. Ah, those evil numbers from the real world strike again, such infamy! I tried to find something worthwhile in that list, when it first appeared with the "450 peer-reviewed studies". It was just an amateur attempt, of course. I picked one or two, then challanged some skeptics friend to pick some too. I think we went over some 6 or 7. They were all either non-peer-reviewed (E&E or opinion piece, for example), or did not challenge the consensus (like some paleoclimate study saying that sometime in the past we had higher temperatures somewhere, or saying that the PETM cannot be explained by CO2 alone). I'm sure there MUST be some real challenge hidden in there, but the "denominator" certainly chops it down to just a handful (if any). 1. It must disagree, even if only slightly, in part with some aspect of CAGW as defined by anyone, even a newspaper, rather than disagreeing with the IPCC or mainstream scientific opinion (eg Knorr). 2. The paper may confirm fundamental properties of AGW (Scafetta & natural GHG feedbacks). 3. The papers can hold completely opposing views with each other and that’s ok (Gerlich, says no greenhouse effect, Scafetta says there is). 4. The paper can be seriously flawed (Idso). 5. The paper doesn’t have to be from a climate scientist, pollitical views are ok.
6. "Poptech", the guy who maintains the list, doesn’t have to agree with the findings of the paper, in this way they can avoid the conflict of point 3 and dispute point 2). Excellent article. I'm glad to see someone making the effort to put things into perspective. Ah, so because I live outside the US, I'm not a scientist (I'm not in the real world, but I could apparently qualify as being one in the US!). Related topic - the scientific summary in the pdf on that petition site: can you provide an analysis of the points that they raise? Toolmaker... Good catch. Updated the post. Toolmaker... Regarding an analysis of the points made on the OP, that's a little outside the point I'm trying to make with this article. The main thing about Poptech's little list is that no matter what the authors of the papers actually think, they are, in his own mind, supporting his own version of what he considers 'AGW alarm' to be, i.e. he has his own world-view and beliefs and he can twist any paper into agreeing with what he thinks 'alarm' means. It's a very good example of Conservative reality-creating, necessitated by the real world being too inconvenient. I would be very curious to know how many papers PopTech has read in order to get 850 that he believes challenge "AGW alarm." Oh, BTW: I see the comments have already made a good start on it, but I'll mention it anyway: once you have shown that even giving them the benefit of the doubt, the numbers are not behind them, it really does make sense to go ahead and show that they never deserved that benefit of the doubt in the first place. Like Polar Bear said, there are a lot of people with degrees who really don't know much science, even with nursing degrees, where they really should have learned something about it. Sad to say, there are even a lot of people with medical and engineering degrees who think they know science, but most of what they 'know' about it isn't even true. Why, I'll go even further and say that there are too many "practicing scientists" who don't even really know science. I have in mind this one individual with a PhD in science who publicly humiliated and ridiculed a fellow scientist for pointing out the unsolved problems in the presenter's thesis in a seminar on biology that took place at a major biotech company. But such criticism IS a vital part of the scientific method: if your conclusion/proposal cannot survive sound criticism, then it is unscientfic. "And if no exception occur from Phaenomena, the Conclusion may be pronounced generally (p380)". But how will we KNOW whether or not exceptions occur, if we silence objections like this? We MUST allow them, as long as "they are taken from Experiments or other certain Truths (ibid)". In the case I am criticizing, they were. Objections can be silenced only when they are truly unscientific, such as the objections of Lindzen and Monckton, which are neither from experiments nor from any other kind of "certain truths". NB: Newton's 'Opticks' is in Google Books. It is worth reading the citations above in context, since his description of the scientific method is SO good! Right you are. But isn't it sad? Doesn't it say something is terribly wrong about our so-called "scientific peer review"? After all, the paper really did somehow manage to squeak past. Even if they are a minority of papers that passed peer review, this is really, really bad. Even if you had been more liberal in your treatment of the OP or Poptech, it would still have demonstrated that it's little more than "grandstanding". It's like these outfits try to prey upon gullibility by speaking as if they have some ordained authority. The sad part is that there is an element of realism to it. I don't know about the rest here but I come into contact with plain old Joe of the streets on a daily basis. And I find most are simply misinformed, citing garbage like this, and could care less to find out the real truth. Oh, lest I forget those who would deny the truth based upon some "higher" belief, or those who deny just because it's in their nature to do so. Most of them are too busy trying to be the nice hand fed puppies that they are, mindlessly sipping their Latte' from Starbucks. Most don't hold opinions of their own design. Don't worry about not being counted as a real scientist just cause you live outside the U.S. The Ville, cause "Your not a Real American unless Your a Marine" either, or so the story goes. And to think that all these years I was raised to believe that a Real American was -- an Indian. I limited the search to the term "climate change" and only searched articles in the subject areas of 1) Biology, Life Science and Environmental Science, and 2) Physics, Astronomy and Planetary Science. That returned 954,000 articles. I got 622,000 by folowing the same exact criteria but when I dropped the quote marks on "climate change" I got 956,000. Hmm... I see that Wikipedia says tt is estimated that approximately one percent of the general population are psychopaths. It goes even further than that though. I have a Bachelor of Science-with Honors-& work in a scientific field (Molecular Biology/Soil Microbiology). I understand the Scientific Method well enough-& know how to read a scientific paper-to be able to understand when a theory is supported by good evidence. Yet if someone were to make an "appeal to authority", & get me to sign a petition saying I support the theory of AGW, I don't know if I could do so in all good conscience. Not because I *don't* support the theory of AGW (because I do), but because ultimately I don't have the background to sign such a petition honestly. So it *really* bugs me that there are supposed scientists out there who are prepared to dishonestly lend their names to a petition about a subject which the majority of them clearly know even less about than I do. After #22 I wouldn't be surprised if "850 Peer-Reviewed Papers Supporting Skepticism of 'Man-Made' Global Warming (AGW) Alarm" suddenly becomes "851 Peer-Reviewed Papers Supporting Skepticism of 'Man-Made' Global Warming (AGW) Alarm". Also note that in Poptech's world, a paper in E&E is perfectly equivalent to a paper in Science, Nature, or even Geophys Letters. Wonder what the numerators for cross-journal citations are like? Tell me, Poptech, how many peer reviewed papers in favor of Climate Change would you estimate there are? More than or less than 850? If greater than 850, by how much? An order of magnitude or two perhaps? By the way, what do your links at #17 have to do with the number of Climate Change articles? You know, Poptech, if I were trying to build a *scientific* case against Global Warming, I'd be very leery about using a journal that isn't ISI listed, & whose editor has publicly admitted that the journal has a "political agenda"-namely backing so-called skepticism. You criticise others-with no evidence-of using non-scientific sources to bolster their argument, yet you've clearly felt a need to pad out your own rather dubious list with the pseudo-scientific nonsense published in E&E-talk about an own goal right there! Poptech - Funny: I get 2020 Google Scholar finds with quotes, 67,700 without. "I just would like to point out you scored your own goal regarding the Oregon Petition as you would have to apply the same numerical standards to lists of proponents of AGW. Thus you have done nothing but help support that there is no consensus." Hmmm, this just displays your ongoing, blind ignorance to what scientific consensus actually is. Its not a popularity contest, no matter how much you try & make it so-its about the *scientific evidence* that either backs or debunks an existing theory. To date, though you've been quick to cite those papers that allegedly support skepticism of AGW (even though some are contradictory or don't, in truth, support skepticism as you claim) you've not been honest enough to do your own search of the literature to see how this stacks up against papers that *don't* support AGW skepticism. If you were an honest skeptic, & not merely a propagandist, then you'd have the common decency to do this. PopTech... Thanks for stopping in. re: #32... I actually deselected the patent button when I did the search. I also went through the list fairly thoroughly and noted that most all the articles listed were from actual published papers, as I noted. Another point, Poptech, is that its *irrelevant* how many proponents/opponents to AGW there are out in the general scientific community-at least as far as true consensus goes. What is relevant is the number of proponents/opponents to AGW there are within the broader climate science community-& the evidence that they have to back their position. To the best of my knowledge, there are as few as a dozen Climate Scientists who do not back the consensus view on AGW-& at least two of those (Lindzen & Choi) are only in disagreement insofar as how bad AGW will get in the future-though the evidence they provide for that position is less than compelling. Based on your list, though, you happily include the papers of these, shall we say, "luke-warmists" in you list of papers to further pad it out. You also have included at least half a dozen papers that claim this is all part of a natural 1500 year cycle-even though there is still NO EVIDENCE to back that view (the last warm period, after all, ended *less* than 1,000 years ago (700 years to be precise), which would mean this supposedly natural "cycle" is a good 800 years early. Even if you take the 1500 years to start from the *beginning* of the last cycle, its still 200 years early). I've not had time to do a full analysis of your list of papers but, if that's the quality of them, then your position is *incredibly weak*! Moderator Response: (Daniel Bailey) I had to warn Poptech so I have to warn you, Marcus. Please, no more all-caps. Thanks! E&E is the only publication with scientific pretense that acknowledges and even claims a bias toward a certain conclusion in research results. It was created and has been maintained to be "a platform" (Sonia B.C. 's words) for "skeptics." The main criterion is not the work's quality but its intention. That's a pathetic perversion of everything science stands for. How Sonia B.C. managed to have this piece of garbage listed as a peer-reviewed science journal reflects on her relational skills and aptitudes to work the system more than anything else. If it appears in print, it is a rather sad thought that a tree was cut to support this nonsense. Even the pesky junk mail deserves to exist more than this thing. PopTech... Sorry you're disappointed with my article but you fail to even listen to the authors of the papers you list regarding their positions on the issue. I don't think you have any room to be pointing fingers in this case. If I were to go through a more rigorous exercise from my side of the issue that would require that I do the same on your side as well, such as evaluating whether E&E can legitimately be considered peer-reviewed. This is a case of, be careful what you ask for. "Whether a journal is indexed by them is purely subjective and irrelevant to the peer-review status of the journal." Yet every scientific journal of note is listed in ISI-which clearly means that the *entire* scientific community sees ISI listing is highly relevant-at least as far as peer-review status. In my own field of expertise, nothing short of publication in an ISI listed journal counts towards your publication record. Face facts, you just don't want to admit that E&E is a poorly "peer-reviewed" journal-established for purely ideological reasons-that has delusions of grandeur. "You failed to go through every single search result, confirm they were all peer-reviewed papers (not a news item, editorial or letter to the editor) from a peer-reviewed journal, not a duplicate listing and explicitly endorse AGW theory." So sure are you, Poptech. On what basis do you make such a bold claim? How do you know Rob didn't do exactly that? You expect us to take-at your word-your claim to have thoroughly checked all the papers you list as supporting the skeptic position-even though the evidence strongly suggests otherwise, yet you don't afford the same courtesy to Rob or any of the other posters here. Talk about typical denialist hypocrisy. PopTech said... "I just would like to point out you scored your own goal regarding the Oregon Petition as you would have to apply the same numerical standards to lists of proponents of AGW." That's not the case because I would never use such absurd standards to evaluate a scientific issue. Would I poll everyone with a BS or better to evaluate a medical procedure? No. The proper way to evaluate a specific scientific issue is to ask the specialists in that field of research. And I'm sure you are quite aware of the results of Doran 2009. If you are going to claim that other journals "arbitrarily refuse papers because they come from a skeptic" you are going to have to back that up with some evidence. PopTech said... "...she simply does not arbitrarily refuse papers because they come from a skeptic as other journals do." In other words, E&E does not bother to thoroughly review their published papers, unlike other journals. I am glad that Einstein ignored the numbers that were stacked against him when he came up with the theory of relativity and challenged the ruling paradigm of Newtonian physics. It only needs one person to be right. The AGW paradigm may be correct but it will not be proven by numbers – it will only be proven by facts that are shown to comply with measured data. "The papers supporting the 1,500 year climate theory are include because that is one of the skeptic's theories." A theory, Poptech, needs *evidence*-& the evidence for the 1,500 year climate "cycle" is weak & often contradictory. That you included these unproven hypotheses in your list of peer-reviewed articles merely highlights the weakness of your original claims. Equally weak is your claim that other journals arbitrarily refuse papers written by skeptics-when all the evidence proves that skeptic papers *are* published in these journals *if* they meet the basic standards of peer review. What E&E does is abandon those standards in order to promote its skeptical agenda-hardly something I'd be keen to put forward to promote my case. AGW has mountains of measured data. If the doubters intend to overturn the established order they had best get to work producing some numbers and data of their own. It can be done, if your doubt is science based. PopTech said... ".Do you always fail to read everything you attempt to "analyze"? ..."
What you do in qualifying your list this way is essentially render it meaningless. Basically what you've done is stated that whatever you say goes regardless of any outside normalcy. You've created your own alternate universe that has no bearing on the world the rest of us live in. Angusmac @ 46 - I am glad that Einstein ignored the numbers that were stacked against him when he came up with the theory of relativity and challenged the ruling paradigm of Newtonian physics. Your history is a little fuzzy. Einstein developed ideas put forward by others years earlier. You could research this stuff you know. #40: "papers supporting the 1,500 year climate theory"
Funny how if you search Google Scholar using "1500 year climate theory" in quotes, you get 0 results. "1500 year climate cycle" gets a measly 2 pages, mostly Singer, Loehle and company. But I always thought it was the quality of the papers, not the quantity of papers that counted. PopTech said... "All published papers are rigorously peer-reviewed." Really? Hm, the rest of the scientific community doesn't seem to agree with that position. @ poptech, who said: "This is just a theory of mine based on researching this." Poptech, are you going to publish your research in E&E or on your own website? I'd be very interested in seeing the data (if any) that you have based your 'theory' upon. Perhaps your 'theory' is only a hypothesis of yours and you have not yet collected any data one way or another. Sorry, mods. I've had a bit of fun since poptech has joined in and has highlighted how far he is willing to go in his unscrupulous mischief. He is targeting those lacking basic research skills who are of a denialist bent. Not sure why he thinks anyone on this website would fall for his transparent 'tricks'. PopTech said... "I just irrefutably demonstrated that only around 1900 papers even include the phrase "anthropogenic global warming". Thus it is literally impossible for a paper to endorse something it does not even mention." Hm, so by your standard a paper that mentions "climate change" doesn't count. A paper has to specifically use the term "anthropogenic global warming?" 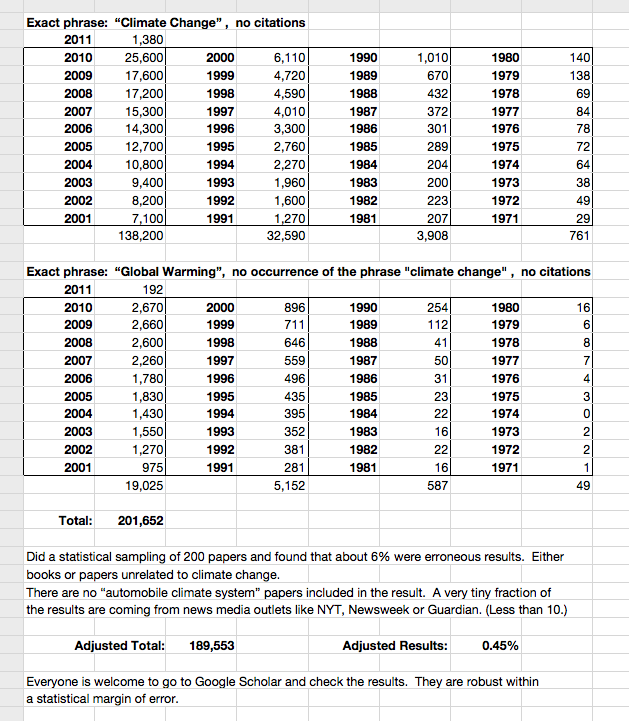 #56: "only around 1900 papers even include the phrase "anthropogenic global warming""
Or not. Try anthropogenic "global warming" (quotes as shown), you get 47700 hits on Scholar. PopTech said... "If the list was so meaningless we would not be having this discussion." What is meaningful is the fact that you are creating a red herring that is suggesting to people that there is a wide body of research that contradicts climate change. All I've done is put your list in a broader perspective. Sorry if that's inconvenient for your. PopTech said... "It doesn't count as in explicit support of "anthropogenic global warming" theory, correct." Ah. Climate change has nothing to do with anthropogenic global warming? Is this right? PopTech... I'm sorry but there is not a wide body of research refuting AGW. You've managed to qualify yourself into a very tiny little corner. PopTech... Not a straw man at all. I'm just trying to clarify your position. #64: Can't have it both ways, PT. Your criterion was "it is literally impossible for a paper to endorse something it does not even mention" and thus you came up with 1900 papers. There are 47700 mentions, better start going through 'em all to see who supports what. #71: Sorry, your basic premise of irrefutable demonstration was just refuted. QED. "This is just a theory of mine based on researching this." The initial for that are BS. If you can't substantiate, keep it to yourself. That post should be deleted, as it is a sweeping accusation against many people. I read from you that your research led you to discover many such papers (i.e. your list) and you claimed that only a small portion is in E&E. You're really a funny guy. And by the way, the words I attributed to SBC are her own. E&E is not worth a rabbit's turd to anyone doing real science, whether you like it or not. Your Gish gallop here is entertaining but makes as much sense as Monckton's self contradictory ramblings. Have a nice life in fantasy land.